On January 1, 2017 I start Mission Lifesaver. I wanted to give you my thoughts on why I named this mission the way I did. 2016 was an amazing year on many levels, but it ended on a kind of sour note. In May 2016 I began preparing to step on stage at a bodybuilding competition the following Memorial Day 2017. I had my nutrition, training and supplements dialed in. I began having major problems sleeping and had headaches almost daily. In September 2016 I had to go to the emergency room due to a continuous headache that got worse and worse. Upon entering the ER triage area my blood pressure was 184 over 110. They ran tests and found I had partial renal failure of my kidneys. The ER doctor was incredible. He explained that the kidney issues could be caused by the blood pressure or the blood pressure could be caused by the kidney issues. He prescribed blood pressure medication for my daily use. I am now using a CPAP machine for the sleep apnea. It is believed that the blood pressure issues will get better as the sleep apnea is dealt with. The thing that interested me the most is that my research revealed there was one thing I could do to improve all of the four issues listed above–lose weight! This is where Mission Lifesaver was born. The idea here is to get the above 4 issues under control. My plan is to do this via diet and exercise. I am no longer thinking about stepping on stage on Memorial Day 2017. At this point I am thinking about improving my health numbers before anything else. Mission Lifesaver is a 12 week mission. The first 6 weeks are planned ahead of time and the final 6 weeks will depend upon where I am at the end of the first 6 weeks. I will begin by using Jim Stoppani’s 6 week program Shortcut to Shred. I have always had a problem getting in the cardio sessions I need to hit my goals and Shortcut to Shred addresses that issue by including the cardio in between sets of weight training exercises. I will log my performance during this mission here on this site. 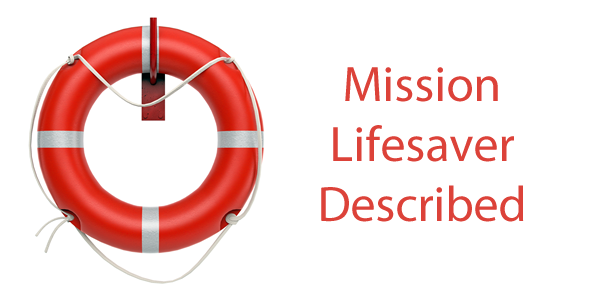 It will be my online progress journal where I discuss my thoughts, feelings and progress on Mission Lifesaver.